Pursuing MBA at FMS Delhi – University of Delhi, is a dream come true for any MBA aspirant. Despite being part of a University setup, FMS Delhi has been consistently ranking among the top B-schools of the country. In an exclusive interview with Jagranjosh.com, Dr. Sunita Singh Sengupta - Dean - FMS Delhi, shares what makes FMS, Delhi stand out and apart from other B-schools in India. She also shares who should pursue an MBA and why! In the interview, she also talks about the teaching pedagogy and learning processes at FMS Delhi and how it helps students acquire the necessary skills and an innovative perspective to deal with contemporary managerial challenges. Who should really do an MBA? Dr. Sengupta thinks that apart from the eligibility criteria put-out by the different B-schools, there are no prerequisite qualities or characteristics that an MBA aspirant should possess. However, there are certain qualities that make a good corporate leader and top B-schools in India like FMS Delhi, harness those qualities. She strongly feels that MBA aspirants who are passionate about management and are really keen to make a difference should pursue MBA from a reputed B-school. FMS, Delhi – being one of the oldest management institutes in India (1954), has a tradition of excellence. The institute trains motivated students to develop their innovative thinking and allows them to acquire entrepreneurial skills. At FMS, Delhi, students are exposed to different courses and sessions, through which they develop critical life skills in combination with the technical or managerial skills which are required to make a good manager. The institute also keeps its course curriculum updated in order to help students go through all the contemporary modules which are relevant for day businesses. According to Dr. Sunita Singh Sengupta, the upcoming and emerging MBA specializations will be the courses which prepare students in the art of innovative thinking as well as the ones that help them gain important life skills. In terms of specific courses, she feels that with the rapid digitization of the world, it is imperative that data related courses such as Data Analytics, HR Analytics, Marketing Analytics, And Cloud Computing and Robotics will be in demand in the field of management education. On similar lines, she also feels that apart from these courses, MBA students will also have to focus on critical life skills, as technical / hard skills and life / soft skills go hand in hand. Prof. Sengupta feels that FMS is a brand unparalleled! It is a red building of dreams for the students who aspire to join MBA course at premier B-schools in India. The B-school has been ranked among the top 5 B-schools in India, which also makes it one of the most sought after MBA institutes in the country. Faculty of Management Studies, Delhi is part of the University of Delhi and therefore the institute is part of a University set-up. In this league, the other B-schools which are part of such a setup are Harvard and Kellogg; and she believes that these are two B-schools that are the direct competitors of FMS, Delhi. At FMS, the institute has a culture of excellence and all the stakeholders including students, faculty members and the administration, work towards achieving perfection which also helps them to develop the best learning processes for its students. In her message to future MBA aspirants, Prof. Sengupta says that one of the key tenets at FMS is to inculcate the basic human value of humility and service in our students. So, while the institute constantly works on achieving and maintaining its global positioning, at the same time, it also works relentlessly to make the management education it offers rooted in culture philosophy and management for societal cause and social efficiency and happiness. Social efficiency and happiness is one of the building blocks of ancient Indian education system, and FMS tries to create social consciousness among the students so that they are able to make a social impact tomorrow. She also feels that all the students who become part of FMS Delhi are privileged to be part of such an institute and they have a moral and social responsibility towards the unprivileged sections of our society. Therefore, MBA aspirants and graduates must look beyond placements and think what they can give back to the nation and the society. 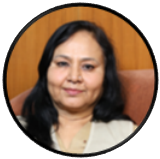 Dr. Sunita Singh Sengupta is the Head & Dean of Faculty of Management Studies, University of Delhi. Dr. Sengupta holds a P.hD in ‘Power Relationship between Managerial and Non-Managerial Personnel in Banking Organizations’. Prior to joining FMS, she has worked as an Associate Professor for about 10 years in the Behavioural Sciences Group at Indian Institute of Management Calcutta. An author of 28 books and more than 5 dozen articles in national and international journal of repute, Dr. Sengupta is a widely travelled scholar and has lectured in USA, UK and France.